“Trick or treat, smell my feet. Give me something good to eat. 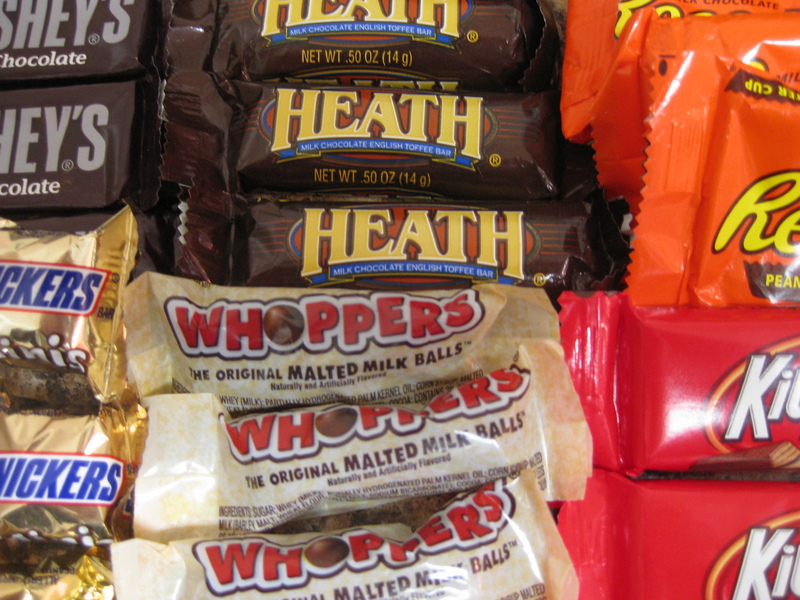 I think we’ve all established at this point in the blog that I love candy. When we were kids we used to go trick or treating together, my sisters and I generally dressed up as some trio of characters, the best was 101 Dalmatians and Cruella Devil. My 2 year old sister was Cruella Devil. It was priceless. Also extortion. She had no way to protest this costume. Poor thing. Anyhow, we’d come home with bags of candy, and we’d have to pour everything onto the kitchen table before eating a single piece. Any “gummy” or “chewy” candies such as Tootsie Rolls, Laffy Taffy, etc. had to be given away. They’ll rot your teeth, we were told. If anything was half-open we’d also have to throw it away. Someone could have poisoned it, we were told. Let me interrupt this story by telling you that my parents were marketing geniuses! Imagine the horror in our eyes thinking of our teeth rotting and falling out of our mouths. It could happen to us. We were vulnerable. That scare tactic worked beautifully, and we immediately gave that candy away. And then, to think that someone, some old, wrinkly and freakish person could actually poison our candy? Fuggetaboutit. We were scared $hitless. And again, we immediately threw that candy away. More of the story: fear works every time. Now that I am much older and wiser, I firmly believe that my father ate each and every one of those “too chewy” or “slightly opened” pieces of candy. It’s the same thing as when he’d say at a restaurant, “let me be the first to taste that piece of dessert, just to make sure it’s not poisonous.” We fell for it every time. He probably laughed about it for days. Genius. Bona fide brilliance. Anyhow, after removing the half-opened and gummy candies we’d be left with the usual junk, and we’d savor every last piece until Passover when my mother would demand that we get rid of it. How it managed to last that long is beyond me. In fact, full disclosure, when I ran out of my own candy, I’d sneak into my little sister’s bag and steal hers. She was too young to know I was pulling a fast one on her. Worked every time. This year I didn’t get any Halloween candy. It was tragic. But, thankfully my coworker has been bringing in oodles of left over candy and I’ve been hoarding that stuff like it’s going out of style. 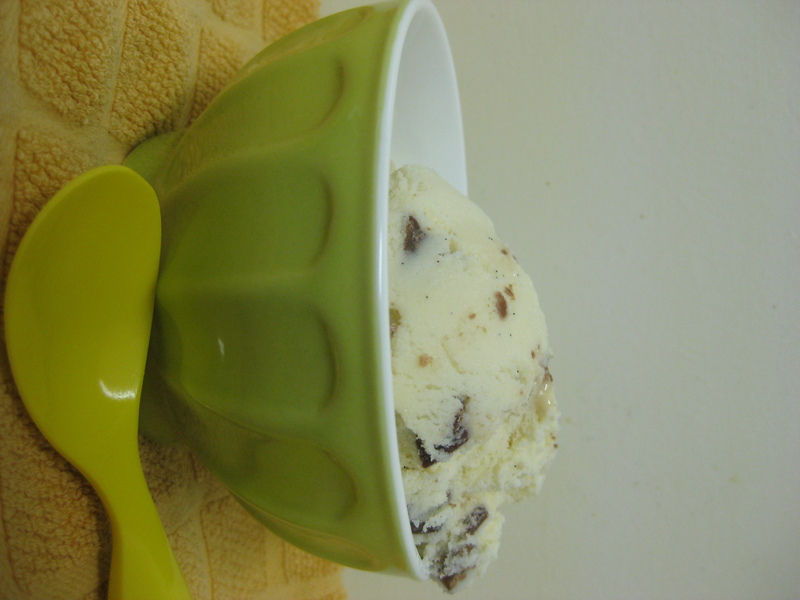 Finally, it dawned on me that Halloween candy ice cream was in order, so there you have it. Trick or treat! 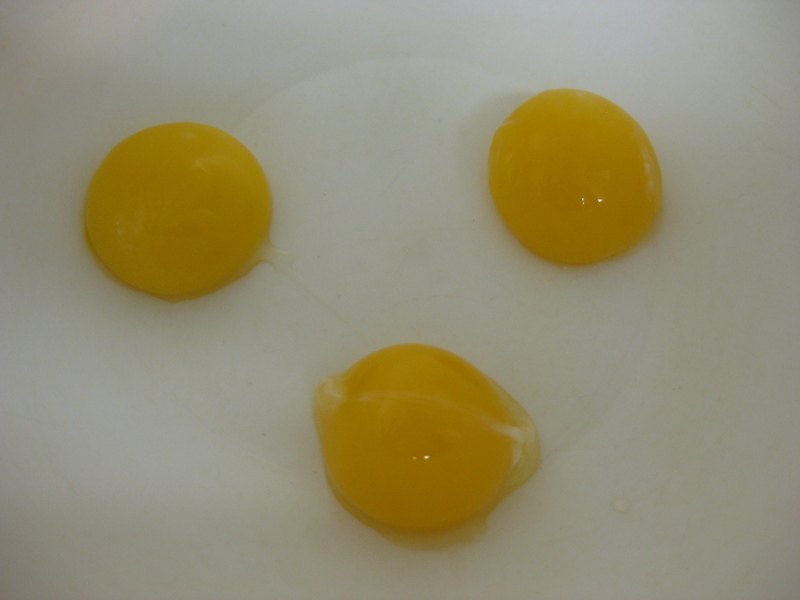 Look at those egg yolks. This photo makes me giggle for some reason! First chop all the candy into bite-sized pieces and set aside. Feel free to use any type of leftover candies – it’s a great way to finish your Halloween treats. 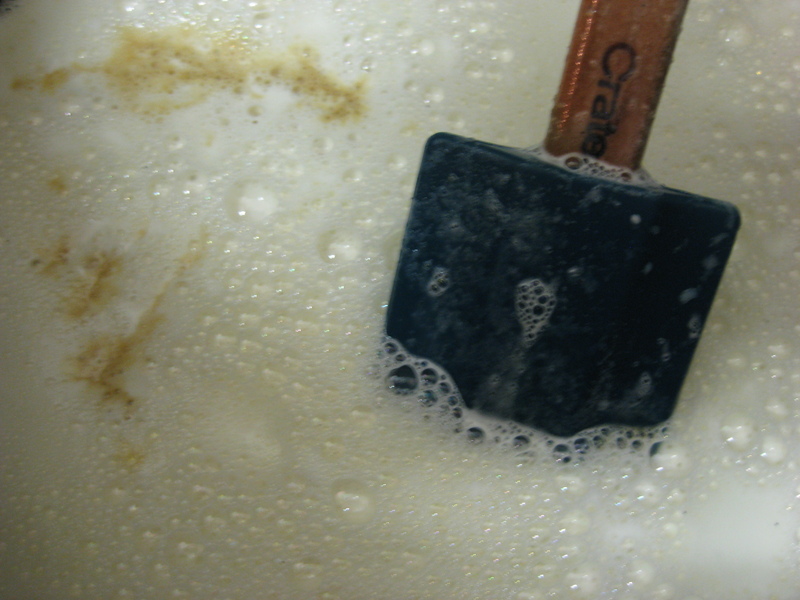 Next, in a large saucepan, heat 1 cup of half-and-half, 1 cup of milk , the vanilla bean paste, and the sugar. 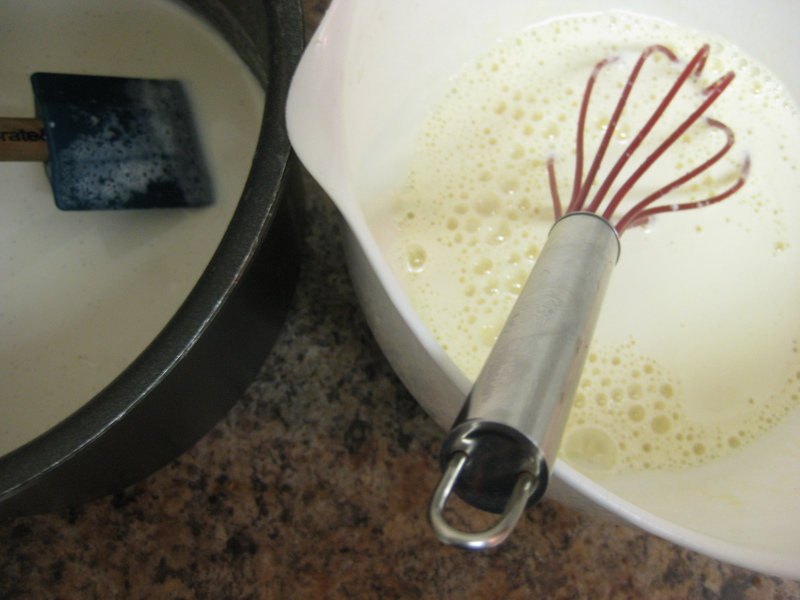 While this is heating, in a large, heat-proof bowl whisk together the egg yolks until they thicken slightly. Once small bubbles begin to form around the milk mixture, remove from the heat and slowly pour in batches over the egg yolks until all the liquid is thoroughly mixed into the egg yolks. Pour back into the pot and heat until it reaches 185 degrees or it is thick enough to coat the back of a spatula. Remove from heat. Slowly pour this mixture into a bowl containing the remaining cup of half-and-half. Add in the vanilla extract and let cool completely before refrigerating for at least 2 hours. 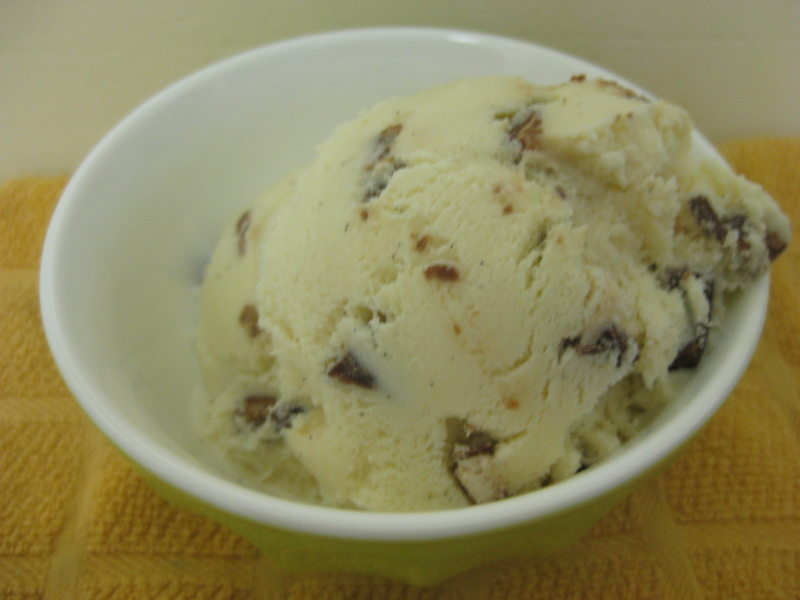 Remove from the refrigerator and pour into the base of an ice cream maker. Churn according to the manufacturer’s instructions. 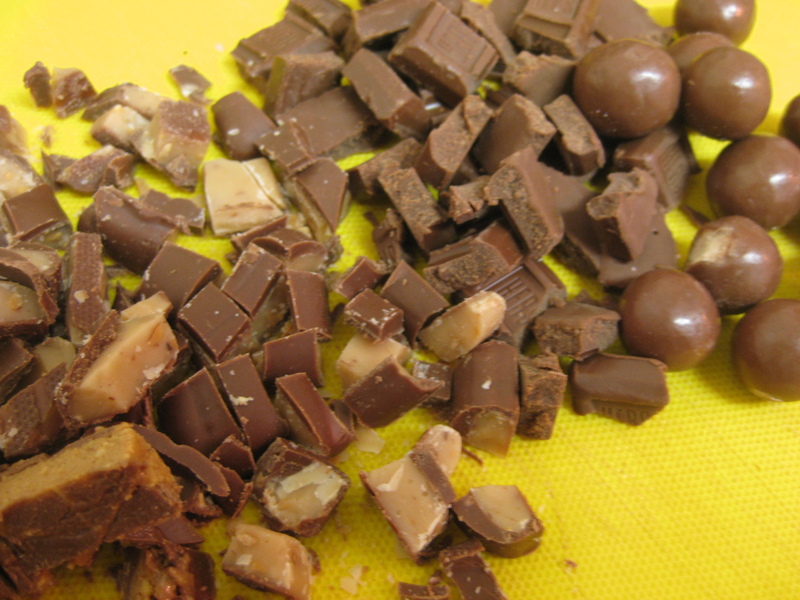 Approximately five minutes before the ice cream is done churning pour in the chopped candy. Once done churning, transfer to a freezer-safe container and let harden in the freezer for at least 2 hours before enjoying! The Verdict: This flavor is just like being a kid in a candy store and it doesn’t get much better than that! I’m sure many of you enjoy the soft-serve ice cream places where you pick a flavor and load up on great toppings. Well, my friends, this is even better because the toppings are already swirled into the ice cream. It’s beyond delicious. One of my royal taste testers tried this flavor (first time he ever had 365scoops) and, with his mouth full of ice cream he exclaimed “this is the best stuff that I’ve ever tried.” Enjoy!